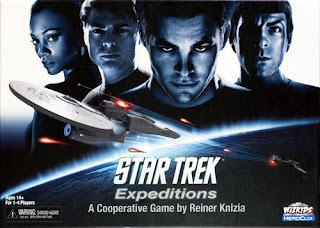 Star Trek Expeditions: A Cooperative Mission Game designed by award winning game designer Reiner Knizia. Play as Kirk, Spock, McCoy and Uhura as the U.S.S. Enterprise enters orbit around the planet Nibia. You find the President of Nibia less happy to see you than the invitation suggested, and Mr. Spock has detected evidence that another starship may have recently been in orbit. You must lead your away team down to the planet's surface and discover what has changed Nibia's relationship with the Federation, and unravel the mysteries of Nibia! Ready your phasers, and prepare to beam down!